Seniors are being offered free travel on Transport Canberra services until March 24. File photo. Seniors Week starts today (March 18) with free travel on Transport Canberra services being offered to all Seniors Card holders up until this Sunday, March 24. Seniors can normally already travel for free in the ACT during off-peak times but during Seniors Week their trips will be free of charge any time of the day. Transport Canberra advises that patrons with an ACT/Interstate Seniors MyWay Card can tap on and tap off as usual but they won’t be charged for the trip. Seniors who do not have a MyWay card but do have a Seniors Card just have to show the bus driver their card and the journey will be free. On Thursday 21 March, Transport Canberra will also be providing free bus charters to and from Exhibition Park in Canberra (EPIC) for the Seniors Week Expo. The Seniors Week Expo brings together more than 120 exhibitors to provide information on aged care, retirement, finance, legal, home help and modifications, health and leisure, travel, community and government services, special interest and social groups. To find out more please click here. The free bus shuttle service will travel to and from select major bus stations, including Westfield Belconnen, Belconnen Community, Tuggeranong, Woden, and the City. To find out more about the free shuttle service, including timings, please click here. Transport Canberra recommends that seniors use the online TC Journey Planner for details on timetables throughout Seniors Week (March 18-24) and to help plan their trips. 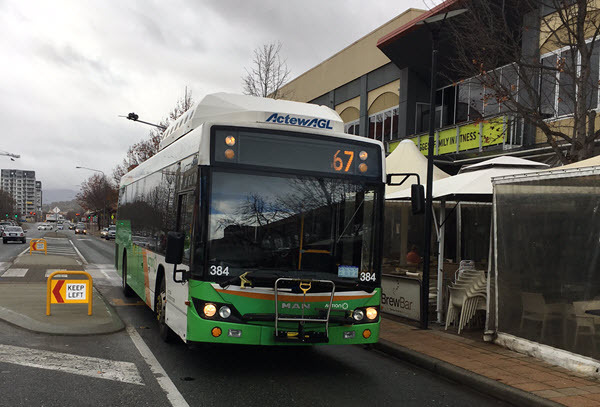 Throughout the year in the ACT, eligible Senior MyWay Card holders currently travel for free during off-peak times between 9 am and 4.30 pm and after 6 pm weekdays, plus all day Saturday, Sunday and on public holidays. May as well get out of the house now Seniors. When the new timetables start many of you may not be able to walk the distance to your nearest bus-stop. I was thinking that may be the case.